I picked up a set of these wheels about a month ago and could not find a definitive answer ANYWHERE as to what hub bore these have. I would have just measured, but my calipers wouldn't fit. I am making this thread purely to get the information out there for people who need it. I finally found 63>56.1mm hub centric rings from Speed Element, who had to get them from Advan USA. 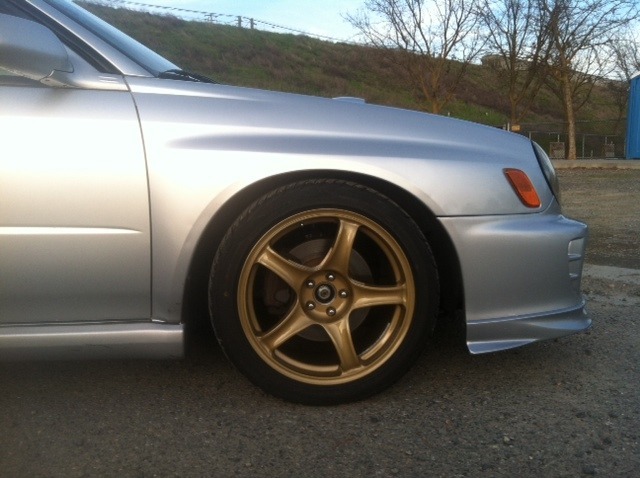 Fitted these on a 2003 wrx with 245/40 Yokohama S-Drive tires and Cusco Zero-2 Coilovers. After mounting the rears I was convinced that they would rub in the hard corners so I rolled the fenders before ever taking it out for a test drive. Rolled the rear fender lip flush with the fender and rolled the fronts moderately between the fender liner tabs, just to be safe. 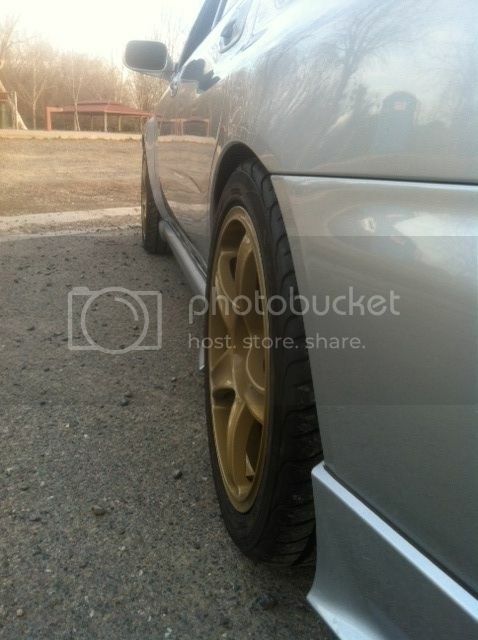 Camber is Approx. -2*F, -1.5*R. So far they havent rubbed at all from driving around town, over speed bumps, and hitting a few good dips on the freeway. 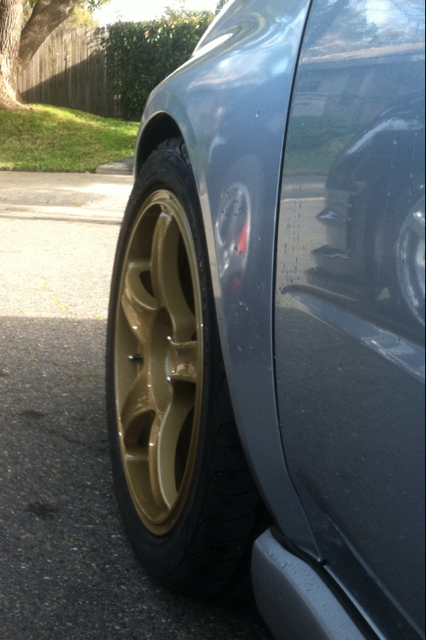 I'll get a few pics up later on tonight to show current ride height. Ill be trying the setup at the track on Friday and will update again afterwards. One for fun... I was surprised they didnt rub at all after seeing some of the bluemilk shots... I was mainly worried that they would rub under hard load so I was very happy when I didnt hear or feel a thing all day. I know that people have squeezed more aggressive wheels and tires onto bugeyes, but coming from 18x7.5 +48's I am thrilled with the way these look and even more happy that the amount of work (or lack of) needed to make them fully useable on the track. Hope this info is useful to someone!! I swear trying to find information on these wheels is like trying to find a person that never existed. Your car looks really balanced! Careful on those S-Drives. They overheat really easy on the track. Thanks! Im coming out of that corner full throttle though so I suppose it's not a truly representative shot. I'll remember that with the s-drives. I was loving them though compared to the 225 hankook v12s I was on last day out. I'm still pretty new to track driving so I don't think I approached their heat limit. I'm in love with the wheels btw. Thanks again. Those are probably the best wheels for the GD chassis. Glad you're using them the way they should be. When the weather gets hot and you are closer to the car's limits, the tires may become an issue. I cooked a set at T-hill, but I was 4-wheel drifting most of the turns. I cooked my old eagle f1s the first time I was out last summer. Starts to feel like you're sliding around on gummy bears. We'll see how the s-drives hold up for me in the warmer weather. Yea that's the 11/12 behind me. Even new guys can go fast on the back straight with enough power Definitely time to stop adding hp's and drive the car as-is for awhile. Thing is, these are rally cars, so they want to slide around corners. Had a NSX on my tail after I passed him, the driver came up to me later and said I was sliding a lot, I said "I know, I steer with the gas pedal. You want me to have a go in your NSX and show you how it's done?" He declined and laughed. We should get out and do a photo shoot with our twin rims! Sounds like a quick way to go through a set of s-drives Yea the Miatas kill it out there, I have ran into some quick s2000s too. Last day I was out I didn't see too many cars while I was lapping. I'm excited to get into point-by so I can run with faster cars, or hopefully at least more cars. Got a few more days of solo till I move up. I'm down for the photo shoot! Lol. I was amazed how good they turned out when I got them back from the coater. The color is almost spot on from what I remember. Still can't find decals though.. You ever order those hub rings? Just take your time in the group you're comfortable in. It gets crazy in open lapping. Point by is cool if slower traffic actually points you by, sometimes they're noobs who have tunnel vision and don't know there's a car behind them. The wheels look good. I can't tell they've been PC'd, looks like the same color. Found these. Did a search on the company, they look legit but it can take a while for the product to reach you as they're in Hon Kong. Maybe there's an I-Club member that does decals. Maybe start a thread asking. Good find! Thanks for that, surprised I didn't find those when I searched. I'm not worried about time so ill prob just order some up from those guys. Btw, did you have to do any more than a roll to get 255s on without rubbing? You should be able to get 255s on with just a fender roll. You can disconnect the rear sway bar and jack up the side of your car, it'll compress the other side and you can feel/see how much of a gap you have between the tire and fender. You should probably look at the strut side and see how.close you are over there as well. 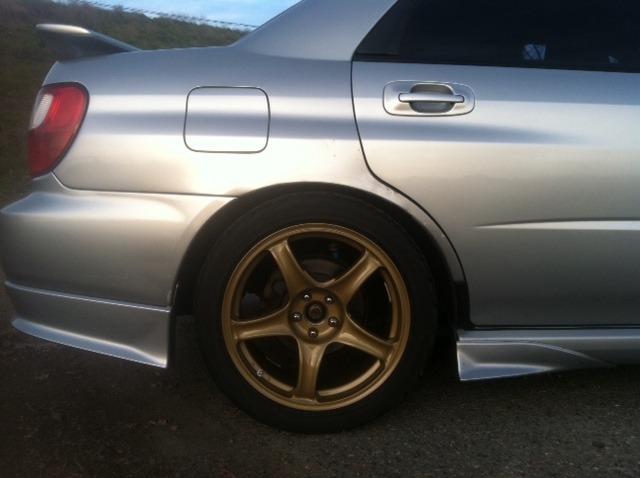 I had to do a lot of adjustments because my coilovers are massively wide. I have a roll and a very small pull on the rear fenders. Thanks for that, Ill PM him and see what he can do. Yea based on the pics from the track it looks like the only concern would be the rears. Ill try the sway bar trick when its time to start thinking about new tires. For now I'm guessing that wider tires would just make my learning curve even slower but who knows. I dont want to get ahead of myself more than I already have. Let me know if you sign up for any track days out at t-hill. Ive been running through ncrc because its so cheap. It would be nice to have someone with some decent experience in the passenger seat. Have you thought about autoxing? 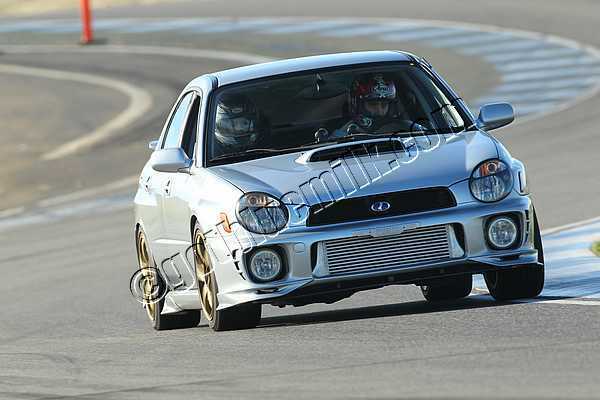 Most of what I've learned autoxing transfers right over to the track, and you learn what to do and not do a lot safer. I considered it but, I've got "I wanna go fast!" Ricky Bobby syndrome. Looks like there's one coming up in April at Mather. Maybe ill see if my m3 buddy wants to go out there... I know he's done a few.